For the second time in several hours, IAF aircraft targeted on Tuesday night a terror squad in northern Gaza, as it was making final preparations to launch a rocket at southern Israel. According to a statement by the IDF Spokesperson's Unit, a direct hit was identified at the terrorists and the rocket attack was thwarted. "The IDF will not tolerate any attempt to harm Israeli citizens and IDF soldiers and will continue to operate against anyone who operates terror against Israel," said the statement. 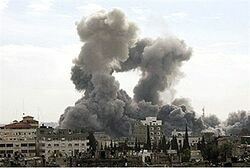 The latest air strike, shortly after midnight local time on Tuesday night, took place about an hour and a half after another terror squad was hit as it was preparing to launch rockets at Israel. In this attack, as well, direct hits were identified. Tuesday night's attacks were a continuation of what appeared to be an escalating deterioration of the security situation in southern Israel. An IDF officer was wounded Tuesday morning when an explosive device blew up during an IDF exercise in the Gaza border area. The officer was flown by helicopter to Soroka Hospital in Be'er Sheva, where he was declared by doctors to be in serious condition, with his life in danger. The officer's condition was little-changed Tuesday night. Prime Minister Binyamin Netanyahu promised a "hard response" after the attack which wounded the officer.